Environmental groups have long pushed for the removal several dams on the lower Snake River to improve salmon habitat. "This is a huge undertaking that's about bringing attention to Idaho's endangered wild salmon, which are no better off now than when they were listed as endangered 25 years ago," Greg Stahl, an Idaho Rivers United spokesman, said in a statement. "Since dams were erected on the lower Snake River, populations of wild fish from central Idaho -- where there's a motherlode of intact habitat for salmon -- have plummeted." 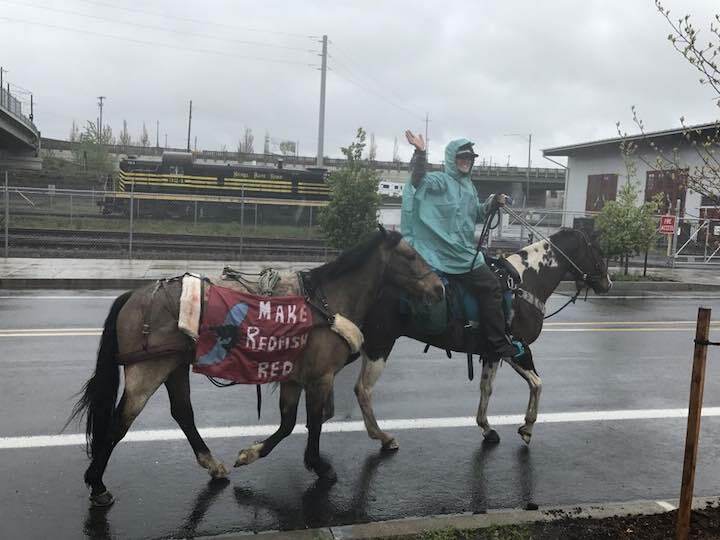 Idaho Horseback Riders on Salmon Trek Pass through Portland <-- Watch video and a Photo Gallery at original site.